The Liberty Hill community will get to experience a new and exciting event this Saturday! 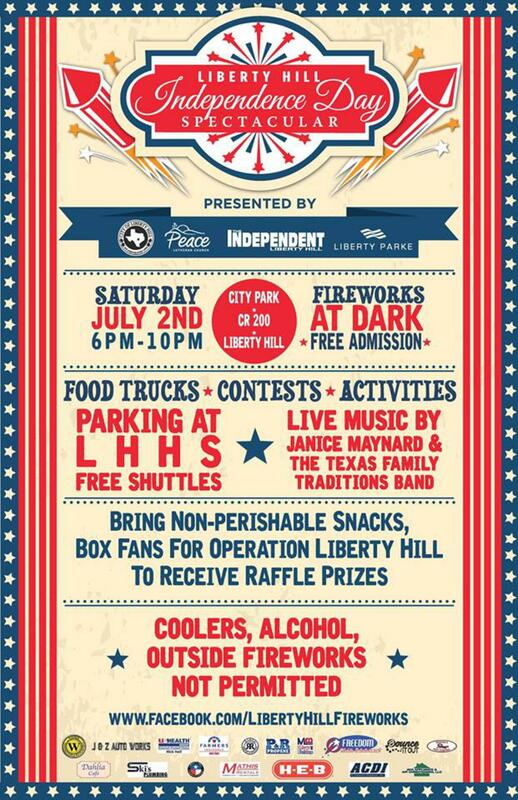 The first ever Liberty Hill Independence Day Spectacular will be taking place at city park off of C.R. 200 from 6-10 PM. There will be lots of good, wholesome fun for the whole family. The event will have a hot dog eating contest, watermelon seed spitting contest, laser tag, food trucks, and bounce houses just to name a few. Parking will be at the Liberty Hill High School and shuttles will be provided over to the park for ease of traffic and parking. The evening will be wrapped up with a fireworks spectacular! For more details pick up a copy of the Liberty Hill Independent or click this link (http://lhindependent.com/independence-day-spectacular/) for more details.